The GearWrench Filter Cap Wrenches provide high torque capacity, and can handle 140 ft-lbs. of torque to remove even the most stubborn filters. Competitive filter cap wrenches do not even come close to the capacity of GearWrench Filter Cap Wrenches. The Metal Drive insert will not deform or break even after years of service. The 3863 GearWrench Filter Cap Wrenches is one of thousands of quality tooling products available from MRO Tools. Please browse GearWrench Oil Filter Wrenches for tools similar to the 3863 GearWrench Filter Cap Wrenches. 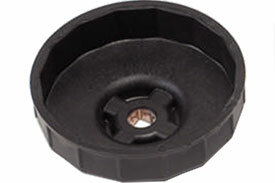 3863 GearWrench Filter Cap Wrenches description summary: GearWrench filter cap wrenches. Oil Filter End Cap Wrench, 15 Flute, 93mm Plastic Quantity discounts may be available for the 3863 GearWrench Filter Cap Wrenches. Please contact MRO Tools for details.